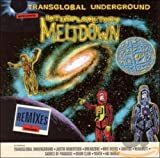 Transglobal Underground (sometimes written as Trans-Global Underground) is an English electro-world music group, specializing in a fusion of western, Asian and African music styles (sometimes labelled world fusion and ethno techno). Their first four albums featured Natacha Atlas as lead singer and their single "Temple Head" was used in a Coca-Cola advertising campaign for the 1996 Olympic Games. In 2008 they won the BBC Radio 3 Award for World Music after the release of their seventh official album, Moonshout. Their most recent release is a collaboration with Albanian brass band Fanfara Tirana entitled 'Kabatronics' which was released on World Village Records in February 2013. Their work has been described as "a collision of tradition and innovation."